The Pet Passport scheme enables you to avoid putting your cat or dog into quarantine when you travel to certain countries (listed here). To qualify for exemption from quarantine, you must meet various conditions relating to your pet's health. The conditions are set out in brief below. We strongly recommend visiting the Department of Agriculture, Fisheries and Food website for the latest and full information well in advance of your travel date. Pets travelling from other qualifying (low risk) countries can also travel into Ireland on the same conditions as set out above. Pets travelling from other non-qualifying (high risk) countries can also travel into Ireland without quarantine provided the pet has a passport/certificate showing identification and a subsequent rabies vaccination. At least 30 days after rabies vaccination a pet must be blood tested to confirm a neutralising antibody titration at least equal to 0.5 IU/ml. A pet may enter Ireland only when at least three months has expired since a successful blood-test. Have a microchip implanted by a vet. Be vaccinated against rabies. This must be done at least 21 days prior to travel. The rabies vaccination will need to be kept up-to-date by way of regular revaccination. 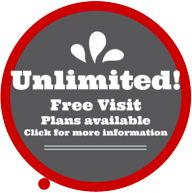 We can inform you how often this needs to be done as it depends on the brand of vaccine used. Get a Pet Passport issued by the Department of Agriculture, Fisheries and Food. 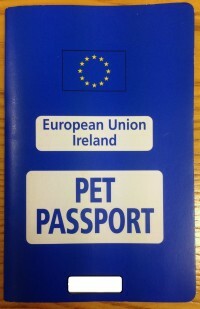 These passports are available at Inishfree Veterinary Hospital. While treatment against ticks is no longer a compulsory requirement , travellers are advised on animal and human health grounds to avail of tick treatment for their pets. Echinococcus (tapeworm) treatment applies only to dogs- dogs must be treated not more than 120 hrs and not less than 24 hrs prior to scheduled arrival time in Ireland. This treatment must be recorded on the pet passport and endorsed by a veterinarian by signature and stamp. Your pet has not been outside any of the qualifying countries in the six months before it enters Ireland.your pet is travelling on an authorised route with an approved transport company. Effective from September 2013 , pets travelling to Britain directly from Ireland need to be microchipped, have a Pet Passport and must be vaccinated against Rabies at least 21 days before travel.